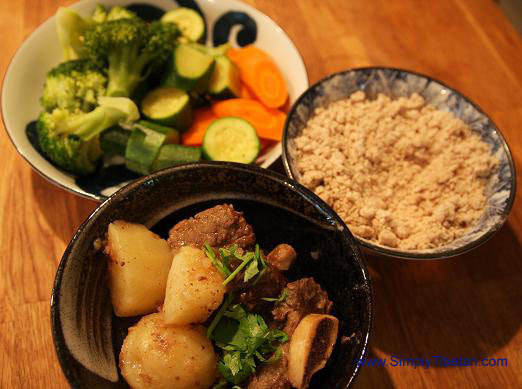 Time to post a recipe for the perennial Tibetan favorite – Sha Shogok. I was talking food and food culture with my grand aunt from Kham, and she says to me Sha Shogok – that’s the simplest and easiest. It’s plentiful and everyone loves it. So I decided to make some Sha Shogok. I had some beef short ribs in the refridgerator and a ton of potatoes. I made this very simple dish – Sha Shogok flavored with Emma, and it turned out so delicious. I was about to boil some rice to go with it when my son walks in the kitchen, peeks into the pot – and says – “Amala … that seriously deserves to be eaten with Pak.” Agreed – my son. How could I be thinking of rice! So, I took out my tsampa stash and we had a dinner of Sha Shogok and Pak. PS – To my son and husband’s chagrin, I also served some steamed vegetables –I can’t help it, I do like to add some color to our food plate!! PPS – … ahem ahem … I did pick a small bunch of fresh aromatic cilantro from my measly little herb garden – just enough to add a little glamour to my meat and potatoes dish ! In a large pot, heat 2 tablespoon oil. 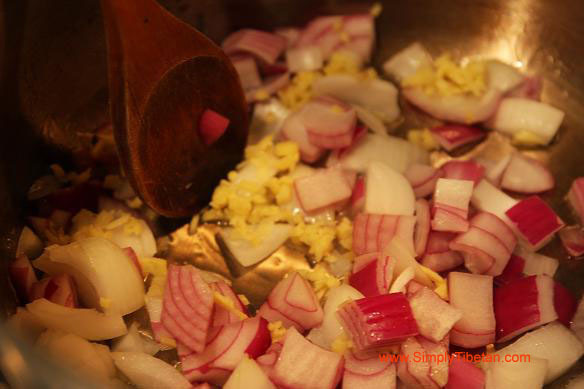 Add the chopped onions and ginger. Fry until onion softens. Add garlic and star anise. Fry until aromatic. Add the meat, ground emma, pepper, salt. Stir and let the meat brown slightly. Once the meat is cooked, then add the potatoes – another 10-12 minutes till the potatoes are cooked. Cover let stand for few minutes before serving. 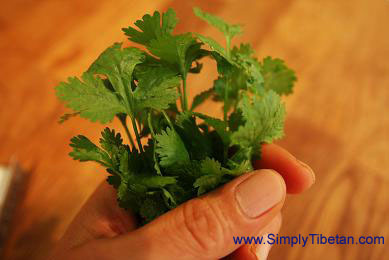 Add some chopped cilantro for garnish and enjoy with Pak or Amdo Bhaley or Rice. 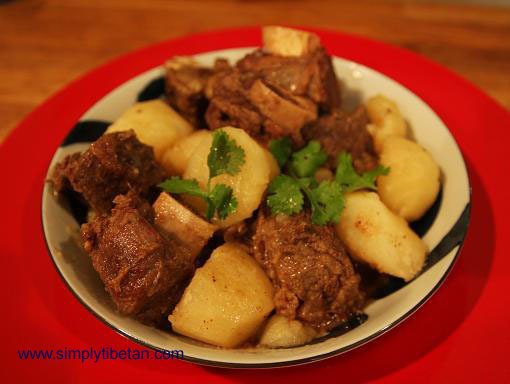 This entry was posted on July 6, 2013 by simplytibetan in Recipes and tagged beef and potatoes, sha shogok, tibet food, tibetan beef, tibetan cooking, tibetan potatoes, tibetan stew.